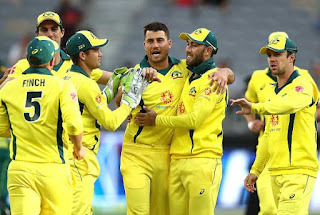 Emboldened by Australia remarkable turnaround in the ODI series against India, vice-captain Alex Carey, on Tuesday, said they are confident of entering the World Cup with a squad good enough to play like defending champions. The five-match series is poised at 2-2, thanks to Australia's back-to-back wins after staring down the barrel at one stage. "As a player in the Australian cricket side we have been working hard in the last 12-18 months. Some success has started to come our way. We are really confident moving with the squad we take to the World Cup," Clarey said on the eve of the series-deciding game in New Delhi on Tuesday. He said he was not surprised by the way the Australian batsmen tackled India's formidable spin duo of Yuzvendra Chahal and Kuldeep Yadav, who have tormented batters with their guile in recent times. "There has probably been a fair bit of media (analysis) about Australia playing against spin in the past. We have worked really hard on playing spin bowling in the nets over 12-18 months. I guess to see some reward, again it's no surprise, but the guys are doing so much hard work off the field," said Carey. "We were out under pressure early in the series. Some games were really close and now we have the series level at 2-2. It is obviously exciting going into tomorrow with the series on the line. Obviously (we will) take some momentum from the last game. The boys are felling confident. "India are going to bounce back quickly but I guess for us we thought we played some pretty good cricket in the first two games and we just fell short so to have the series at 2-2, really excited. I am really looking forward to and so are the guys."